ETSA National Association representatives from left to right: Daniel Dalkowski, DTV; Lorenzo Florindi, Assosistema; Marc Callewaert, FBT; Joseph Ricci, TRSA; Daniel Kärrholt, Sveriges Tvätteriförbund; Ann Vande Kerckhove, FBT; Nathalie Matignon, Geist; Andreas Schumacher, DTV; Bilal Uğurlu, DTV; Shyju Skariah, TSA; and Melanie Saner, VTS. The European Textile Services Association (ETSA) recently held its National Associations meeting in Rome. More than a dozen association executives representing the linen, uniform and facility services, as well as the dry cleaning, industries in Belgium (FBT), France (Geist), Germany (DTV), Italy (Assosistema), Sweden (Sveriges Tvätteriförbund), Switzerland (VTS), the United Kingdom (TSA) and the United States (TRSA) participated. 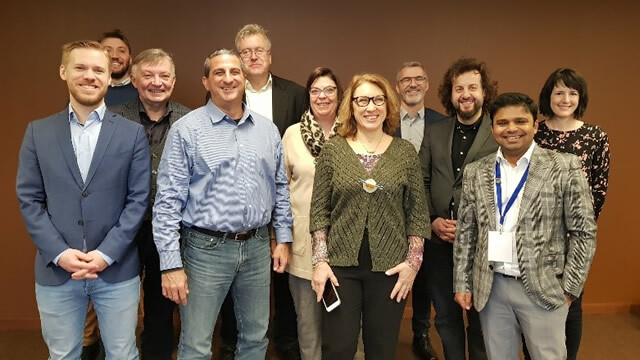 Hosted by the Italian textile services association Assosistema and facilitated by ETSA Secretariat Robert Long, National Association representatives discussed their respective new initiatives for 2019 including customer and potential employee outreach and certification, as well as new training programs and standards development for hygiene and personal protective equipment (PPE). In addition, the group discussed potential joint initiatives including educational sessions at Texcare Paris and Texcare International, research and resources to promote reusable textiles over disposables, and the economic, green and hygienic benefits of commercial vs on-premise laundries (OPLs) and home washing. The organizations also shared updated country-specific economic and labor data, social media and communications activities, market trends and calendars. Finally, TRSA President & CEO Joseph Ricci proposed that the National Associations, with the addition of other organizations outside of Europe, jointly organize the next World Textile Services Congress (WTSC) for June 18-19, 2020, prior to Texcare International in Frankfurt, Germany. Hoping to build on the success and momentum of the 2016 WTSC in Bruges, Belgium, which attracted nearly 200 linen, uniform and facility services professionals, the WTSC format would similarly invite National Association’s Boards of Directors to meet independently the morning before the Congress and join their international counterparts for lunch prior to beginning the WTSC’s interactive sessions in the afternoon. In conjunction with the WTSC, the group also discussed relaunching the International Textile Services Alliance (ITSA) with a new, interactive website in 2019 that would focus on global issues such as natural resources, sustainability, corporate social responsibility, technology, hygiene and labor while facilitating increased information sharing among associations representing the linen, uniform and facility services industry internationally including the Laundry Association of Australia (LAA), China Healthcare Laundry Association (CHLA) and others. The ITSA site also would include news and social media feeds, event calendars, research and other information from participating associations.